Alice’s life writing best fits into the political narrative form. This is outlined by Regenia Gagnier as being written by those with strong political views and associated with the more industrial working class. Gagnier also states that political narratives ‘assert the world changing and the worker’s adequacy to change’ (Gagnier 349). Alice undoubtedly highlights how the world has changed during her lifetime and in doing so also exemplifies her reluctance to change with it. During Alice’s lifetime – from 1880 to 1960 (when she completes her memoir) – there are numerous political and social changes. Those which Alice includes in her memoir are evidently those that either directly affect her or interest her and therefore shed light on her identity and class position. It is worth mentioning that many of the political and social advances made during her lifetime are explained in my post on Politics, Protest and Class, but Alice also includes historical explanations of the different era’s of her own life and her father’s life, that also prove to show how society, though not so much her identity, have changed. 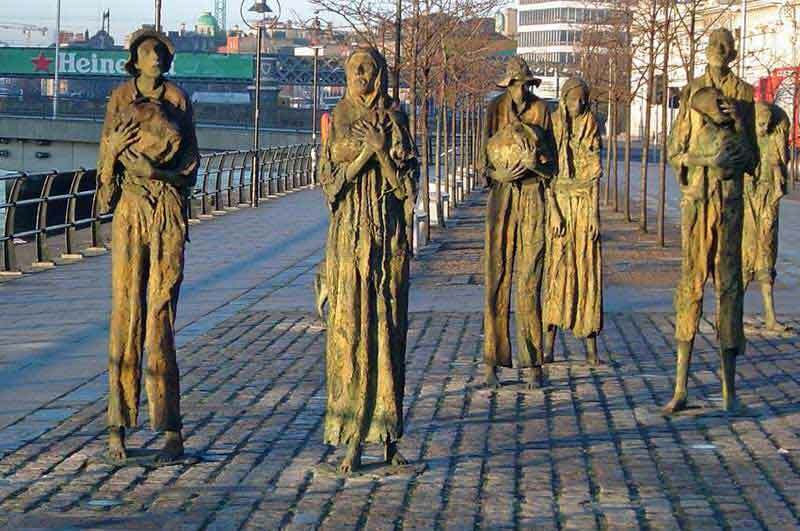 A modern tribute to those who perished during the Irish potato famine, occurred from 1845 to 1849. Alice goes beyond her own life to explain the advancements made socially and politically during the nineteenth and twentieth century. She starts by explaining the ‘hungry forties’ as told to her by her father and describes this era as ‘a black spot in English history and [explains how] God raised up great reformers like Lord Shaftsbury and John Pounds to set the pendulum swinging the other way’ (p.9). Obviously, Alice was not around to witness this for herself nor was she for the fifties, sixties and seventies which she also explains as being ‘hungry’ (p.10). This is all she explains of the 1840s-1870s though. Admittedly she has a good enough reason for not elaborating upon these decades – she was not around to live through them after all – but it is obvious that life had drastically improved by the time Alice wrote her memoir. ‘Now a few words about those 80s and 90s. They saw the coming of the bicycle. 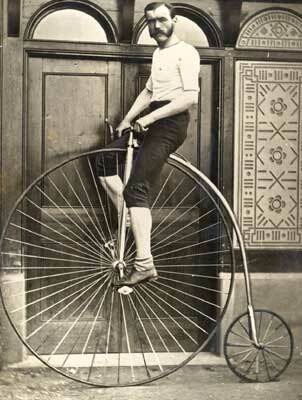 First the penny-farthing, and then the “two ha’ pennies” as I heard it once described… the first bicycles had solid tyres and were aptly called “bone-shakers”. Pneumatic tyres came into fashion about 1896 and were enormous – almost as big as a car tyre – an Austin 7 anyhow…ladies began to ride as well as men. 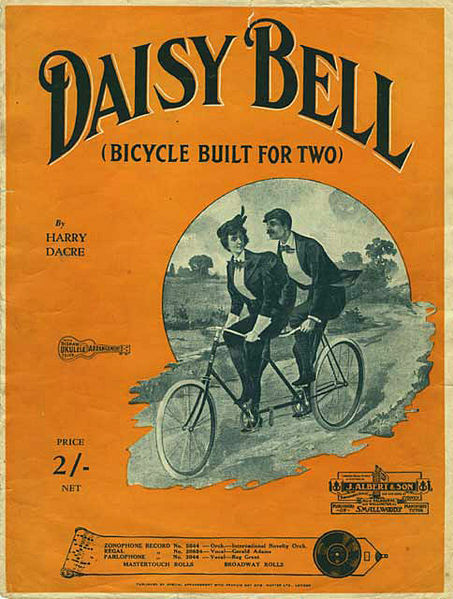 The song “Daisy Bell” was first popular in 1892’ (p.26). 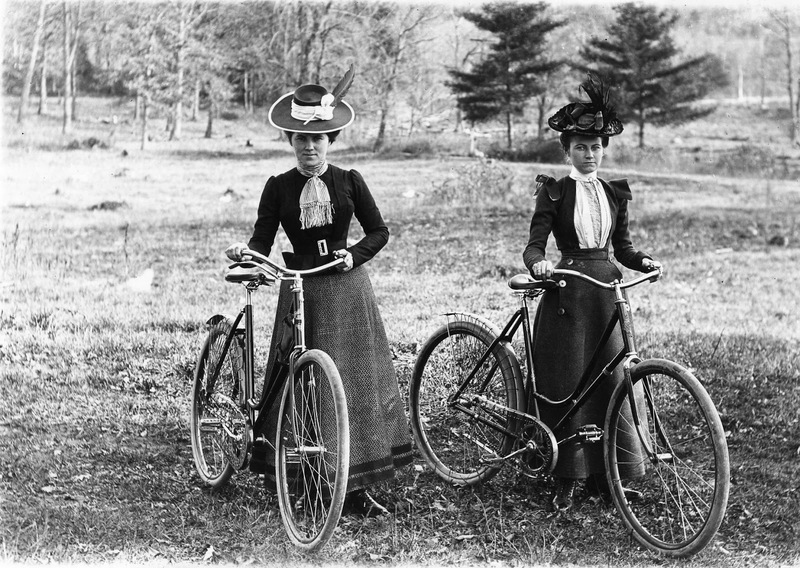 Safety Bicycle ridden by two ladies, invented 1885. Alice refers to it as ‘two ha’ pennies’. “Daisy Bell (Bicycle Built for Two)” song composed by Harry Darce, became popular 1892. It is a popular song with a well-known chorus even today. As can be seen from the above passage Alice’s ‘few words’ about the 1880s and 1890s predominantly explain the history of the bicycle. 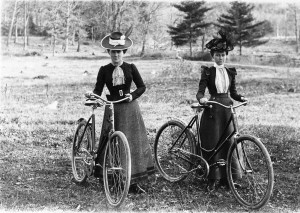 Possibly, this was something that affected Alice’s life in particular; perhaps she felt it was a valid point to include because of the significance it held for women’s rights as they started to ride bicycles too. ‘The terrible upsurge of crimes of violence and the chronic dishonesty of the young people of our time is due, in my opinion, to the decay of the Sunday School and the neglect of the “Ten Commandments”. Nowadays, children do not hear their parents and teachers saying to them week by week, “Thou shalt not steal”, “Thou shalt not kill”. Instead of these injunctions, they are told, “Honesty is the best policy”… And instead of Our Lord’s command to “do unto others as you would like them to do to you”, there is a general tendency to “do or you will be done” (p.55). Alice continues; ‘this is the result of three generations of secular teaching only, in our schools, and the decay of Sunday worship’ (p.55). Clearly, Alice not only links the social and political changes of Britain with the demise of the church but also the change in people’s attitudes. In turn this sheds light upon her identity and how she, unlike the younger generations of the nineteenth and twentieth century, believed moral reform was as important as social reform. Regeina Gagnier suggests that political autobiographies also include ‘the integration of social process and personal development in time’ (Gagnier 351). We can certainly see Alice’s awareness that socially times have changed and running parallel to it her own life has also developed. 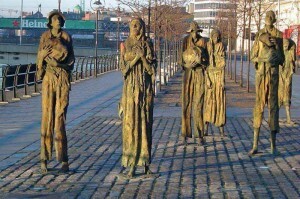 Alice embraces the coming about of social welfare and appears to have climbed the social ladder through the activities and hobbies that she has engaged in over her lifetime, such as regular worship, being a Sunday School teacher, climbing mountains and listening to great preachers in her spare time as opposed to drinking in public houses. Class was not simply about economic position or status for Alice. The social and cultural activities in which she took part were central to her respectable working-class identity. Finally, Gagnier suggests that ‘autobiographers assume the authority to write their own working-class history in order to ensure the subjecthood of working-class autobiography in the future’ (Gagnier 351). As already established Alice is not afraid to voice her opinions. She is evidently aware of her working-class position in society and accepts this but will not allow it to prevent her from being heard and writing a memoir. Possibly, Alice wants to preserve the genre of working-class autobiographies and therefore contributes to it or perhaps she realises the rising acceptance of working-class autobiographies during the twentieth century and therefore is spurred on to involve herself. Alice notes towards the end of her memoir; ‘this little account of a dull life of an insignificant person will perhaps keep my memory green, for as long as there is one person interested enough to read it’ (p.47). She is undoubtedly aware of her ‘insignificant’ position in life and of the very ordinary existence she has lived, but ‘dull’ is something I would not describe her as. Alice has an opinion regarding everything, a comical tone and a sensible, moralistic approach to life that certainly keeps her ‘memory green’. Whether I am the first and last, or one in a long line of people ‘interested enough to read’ Alice Maud Chase’s memoir, I am very glad I have. I hope that I too, have made an active contribution in preserving and celebrating nineteenth and twentieth century working-class autobiographies. Gagnier, Regenia. ‘Social Atoms: Working-Class Autobiography, Subjectivity and Gender’. Victorian Studies, 30.3 (1987), 335-363.